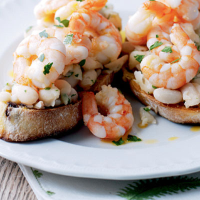 This bruschetta combines a garlicky prawn and crushed bean topping with a hint of chilli oil. A quick and easy recipe for a starter or light supper. Lightly toast the bread on both sides. Drain the beans, reserving 5 tablespoons of their juice. Heat 1 tablespoon of chilli oil in a frying pan and fry the prawns for 5-6 minutes until pink right through. When ready, remove the prawns with a slotted spoon, place them on a plate and keep warm. Add the beans and reserved liquid to the pan and crush with a fork or potato masher so they are broken up, but not completely puréed. Stir in another tablespoon of chilli oil, the lemon juice, garlic, half the parsley and a little seasoning. Heat through for 1 minute, stirring. Serve the toast drizzled with the remaining chilli oil and topped with the beans and prawns. Sprinkle with the remaining parsley to garnish. Try other canned beans instead of the cannellini, such as chickpeas, haricot or flageolet.